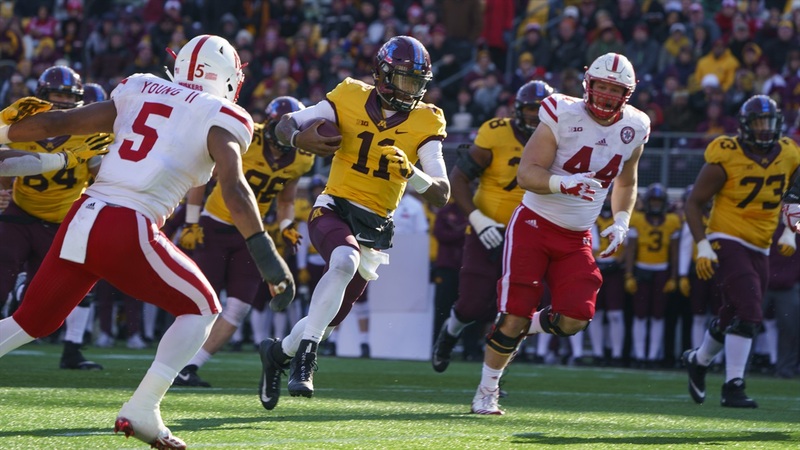 Heading into Saturday’s game against Nebraska, Minnesota sophomore quarterback Demry Croft had rushed for 192 yards in his career. Against the Huskers, he rushed for 183 yards and threw for another 105. This week’s Play of the Game is Croft’s 73-yard touchdown run early in the second quarter. Minnesota led 14-7 after Minnesota returned the opening kickoff for a touchdown and the two teams traded 12-play, 75-yard touchdown drives. Nebraska had a chance to answer, getting stuffed on a fourth-and-1 run inside the 10-yard line. On the ensuing drive, Minnesota keep the ball on the ground, rushing four times for gains of 6, 5, 7 and 2, setting up a third-and-1 from the Minnesota 27. The Gophers ran a zone read with Croft and running back Kobe McCrary. Senior linebacker Marcus Newby crashed in from the edge and went after McCrary, so Croft pulled the ball out and kept it, giving him a one-on-one with freshman safety Marquel Dismuke. Croft faked the outside run and cut it back up the middle, freezing Dismuke so badly that he didn’t even get a finger on Croft. With the rest of the secondary glued to their assignments, there was no one else close enough to make a play and Croft ran 73 yards to pay dirt. The Gophers botched the extra point to make it 20-7, but the two-score separation was more than enough as the Gophers ran away from the Huskers the rest of the afternoon. That zone read killed Nebraska all night as either a shortage of bodies to cover both options or missed tackles allowed the Gophers to rip off some big gains in important moments throughout. “The give or the keep, the one thing I noticed was our safety, at times, was responsible and our safety had a hard time on the edge making the play,” Riley said. Minnesota finished with 12 runs of 10 or more yards and Croft accounted for four of them. The Gophers racked up 409 rushing yards overall with Croft and Rodney Smith both eclipsing 100 and McCray coming up just 7 yards shy of joining them. Croft’s 73-yard touchdown run was Minnesota’s longest offensive play in the game, and it set the tone for several big runs after, including a 64-yarder by Croft. It gave the Gophers a two-score lead and put Nebraska in a hole it simply couldn’t dig out of. That’s why Demry Croft’s 73-yard touchdown run is this week’s Play of the Game.